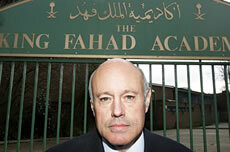 A man who taught English at the King Fahad Academy on East Acton Lane has made allegations to a tribunal this week that the school used textbooks which described Jews as "monkeys" and Christians as "pigs". 58-year-old Colin Cook is seeking £135,000 for lost earnings and claims unfair dismissal, race discrimination and victimisation. All the allegations are strenuously denied by the school. Mr Cook claims he was sacked for fabricated reasons while the school claims he was sacked for misconduct. Amongst the allegations he made are that the school is run as an extension of the Saudi embassy rather than part of the UK, that an Ofsted inspection in March 2006 failed to pick up major issues including unqualified teachers and that he was sacked after accusing children of cheating in a GCSE exam. At the time the allegations were first made just over a year ago in the Evening Standard, the schools's Director, Sumaya Alyusuf, said: "The Evening Standard failed to put any of the allegations to me or any member of the academy’s staff prior to publication. The allegations, made by a disgruntled ex employee, are grossly offensive, highly inflammatory and entirely false and without foundation." Mr Cook also alleged that some pupils "talked as if they did not live in London at all", while others made remarks about killing Americans, praised Osama bin Laden and the September 11 attacks. He also said a school party had been thrown out of Arsenal Football Club's museum when Saudi children fought with other pupils. The school, which opened in 1985 for the children of Saudi diplomats and is funded and controlled by the Saudi government, has denied ever teaching racial hatred. It insists that the offending passages in the books were misinterpreted.